Have you ever experienced a slip and fall accident? Whether you witness someone slip and fall, or you were the victim of the slip and fall, the reaction was likely the same. Victims, for example, might try to get up and walk away as soon as possible. Witnesses might also rush to help victims get up from the floor. Although victims might injure themselves, the embarrassment associated with falling in public might prevent them from stopping to address their injuries or reporting the accident to a party with authority. A few days later, the victims of slip and fall accidents begin experiencing pain or discomfort and later find that they have suffered injuries ranging in severity. Unfortunately, the lack of action immediately after slip and fall accidents can result in the loss of evidence to file a slip and fall injury claim. Did you know you have a right to file a claim for the injuries sustained in a slip and fall accident? Many victims of slip and fall accidents are not familiar with the rights that they have to sue after their accidents. They are also unaware of the duty that many parties have to keep them safe and prevent slip and fall accidents and injuries. If you were injured in a slip and fall accident, you need to speak to a lawyer with experience in slip and fall accidents as soon as possible. The lawyers at Kenmore Law Group can help you understand your rights as a victim of a slip and fall accident. Kenmore Law Group has dedicated many years to helping the victims of slip and fall accidents exercise their rights and fight for the compensation they deserve. If you are interested in suing the party liable for your slip and fall injuries, you must immediately contact Kenmore Law Group. We have provided you with information about slip and fall accidents and claims in the sections below. Although you should gain a general understanding of slip and fall claims from the information provided, it is essential that you speak with an experienced slip and fall attorney in Los Angeles at your earliest convenience. Only our slip and fall attorneys have the expertise necessary to provide you with the details about your claim that will guide you towards a successful lawsuit. Do not hesitate to contact our attorneys—they are ready to help you fight for your rights. If you were a victim of a slip and fall accident, you likely suffered some of the injuries listed above. If you suffered injuries in your slip and fall accident, you must seek legal assistance immediately. Even if you do not believe you suffered major injuries, a medical professional can identify and treat all injuries—even those that are not immediately apparent to you. Seeking medical assistance also creates a clear connection between your injuries and your slip and fall accident. If you wait too long after your accident to seek medical care, it might be difficult to relate your injuries to your slip and fall accident. Grocery Stores—you are doing your weekly shopping at your local grocery store. You walk towards the dairy case to get the last items on your shopping list. As you are approaching the dairy case, you suddenly slip and fall. The dairy case refrigeration system was leaking and had created a puddle of water that you did not see. There were no caution signs warning you of the spill. Video footage of the moments before your slip and fall accident revealed that many store employees walked by and even stepped on the puddle of water, but no one stopped to clean the spill or place caution signs. Store employees and store managers have a duty to keep all shoppers safe while on their premises. By failing to stop to address the hazard, they breached their duty to shoppers and caused their slip and fall accident and, subsequently, any injuries suffered. Workplace—you are working in a warehouse setting. A week ago, a coworker nearly fell off a staircase. Some employees spoke to the employer to voice their concerns about the staircase: the staircase was slippery and should be equipped with stair treads for traction. Although concerned employees voiced their concerns, your employer failed to address the hazard. Two weeks later, you are walking down the staircase when you suddenly slip and fall, suffering back and neck injuries. All employers have a duty to keep their employees safe from harm. By failing to address the safety hazard with the slippery staircase, the employer breached the duty to keep employees safe. The breach of duty caused the slip and fall accident as well as your injuries. If you suffered a slip and fall accident but are uncertain about liability, you must immediately contact a law firm experienced in slip and fall lawsuits. The attorneys at Kenmore Law Group can evaluate your claim and help you identify the party who negligently caused your slip and fall accident and your injuries. Contact us as soon as possible to begin the process of filing a slip and fall injury claim against the party liable for your accident. For more information on the types and amount of compensation you might be eligible to receive, you must speak with a Los Angeles lawyer who is experienced in slip and fall lawsuits immediately. You must contact Kenmore Law Group as soon as possible to discuss the compensation available for slip and fall claim. When you speak with our attorneys, you can be certain that you will be receiving the most relevant information and a commitment to help you recover the maximum amount of compensation available for your claim. If you suffered a slip and fall accident, you must contact an experienced law firm for slip and fall lawsuits in Los Angeles as soon as possible. You must proceed after your claim with a sense of urgency. If you are interested in filing a claim for your slip and fall injuries, you must do so within the statute of limitations. A statute of limitations is a timeline that applies to all claims. For slip and fall claims, victims have two years from the date of their accident to file a claim to remain eligible to sue and receive compensation. If the slip and fall claim is not filed within the two years allowed by the statute of limitations, the victim might lose his or her right to sue. Because of that, you must contact a Los Angeles attorney with experience in slip and fall cases today. When you suffer a slip and fall accident, you must do a few things to ensure that you can file a claim at a later time. This includes reporting the accident to a party with authority (store manager, employer, etc.) and ensuring that the accident is acknowledged in writing. Victims should also take pictures of the scene of the accident, making the hazards that caused the accident clear. Victims should also photograph their injuries and immediately seek medical attention. They must also keep records of all medical bills associated with their injuries. Victims must also speak with an attorney experienced in slip and fall lawsuits. The attorneys at Kenmore Law Group have the experience in slip and fall lawsuits that is necessary for successful slip and fall injury claims. If you were injured in a slip and fall accident, you must contact our law firm and request to speak with our attorneys. Our attorneys will guide you towards the path to receive the compensation that you deserve. Our law firm offers free consultations and free second opinions to all victims of slip and fall accidents. During our free consultations and free second opinions, our attorneys are available to answer all questions, all concerns, and give you all the information you need to a successful slip and fall claim. No matter if you are starting your legal process or if you have already started your legal process at another law firm, you can be certain that our attorneys are available to help you. Our attorneys will never rush through your claim or overlook important details that affect the outcome of your lawsuit. If necessary, our attorneys will amend any issues created by your previous incompetent attorney. Do not hesitate to contact Kenmore Law Group to speak with our attorneys—our attorneys will fight for your right to receive compensation for your slip and fall injuries. Our free legal services are available through a Zero-Fee guarantee. 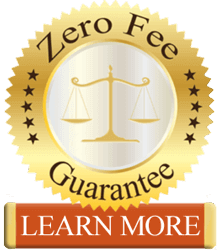 Our Zero-Fee guarantee ensures that our clients never have to worry about paying any upfront legal fees for any of our services. Our guarantee also prevents our clients from worrying about paying legal fees until after our attorneys win their claims. Since our firm is strictly based on contingency, slip and fall victims will not have to pay any legal fees until our experienced attorneys win their lawsuits. If you do not win your lawsuit, you will not be required to pay any legal fees for our services. Do not hesitate to contact Kenmore Law Group to sue the party liable for your slip and fall injuries.